27 | December | 2016 | Cooking With Mr. C.
In a large pot, put 1 cup of water. Add cleaned mussels and cook on a low heat. (about 8 minutes) You want the mussels to open and cook. Drain well. Let cool a few minutes and then remove mussels from shells. Slice avocados to bite size pieces. Put all ingredients in a serving bowl. Cover and refrigerate. Preheat oven to 350 degrees. Take a piece of aluminum foil. Put garlic bulb on top. Drizzle a tbsp of olive oil on top of bulb. Wrap up and cook in oven for about 30 minutes. Let cool and remove garlic from bulb. In a food processor, put garlic, 1/4 cup olive oil and a pinch of sea salt and black pepper. Pulsate for 20 seconds. 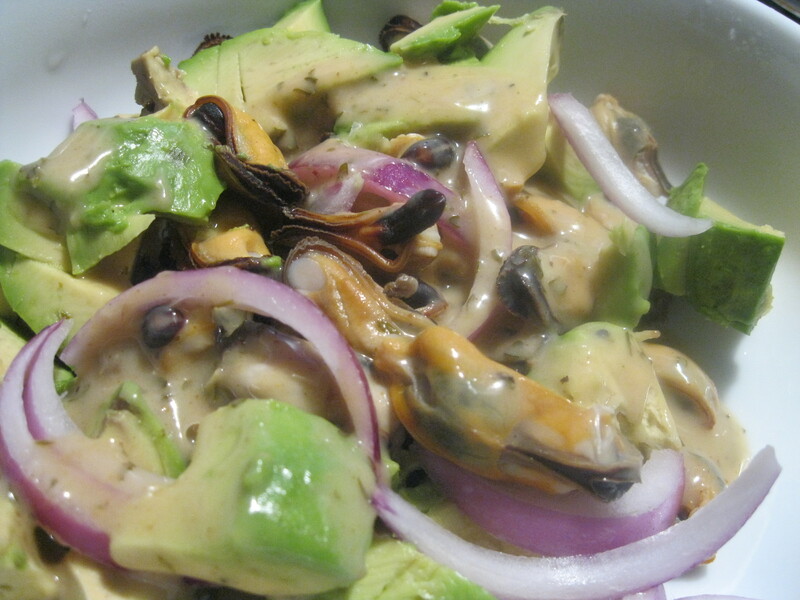 Pour dressing over mussels and serve.